Are you one of Canada’s 2014 envi­ron­men­tal heroes? The most impor­tant envi­ron­men­tal work hap­pens at the local lev­el. 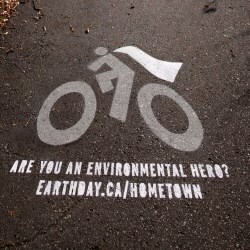 That’s why Earth Day Cana­da is on the search for local Home­town heroes. The home­town heroes Award Pro­gram rec­og­nizes and cel­e­brates envi­ron­men­tal lead­ers, groups and small busi­ness­es who are doing extra­or­di­nary work to cre­ate green­er com­mu­ni­ties across Canada. The Home­town Heroes Award Pro­gram is your chance to help Cana­da rec­og­nize and cel­e­brate envi­ron­men­tal lead­ers — whether an indi­vid­ual, group or small busi­ness — who fos­ter mean­ing­ful, long-term com­mu­ni­ty aware­ness and action. Hero­ic can­di­dates can win the Indi­vid­ual Home­town Heroes Award – a $10,000 cash prize to donate to a local envi­ron­men­tal group/​cause of their choice; the Group Home­town Heroes Award – a $10,000 cash prize to sup­port their work or the Small Busi­ness Home­town Heroes Award – a $5,000 cash prize that must be used by the busi­ness to make an oper­a­tional change that results in the busi­ness less­en­ing their envi­ron­men­tal impact, and per­mis­sion from EDC to use the award and the EDC logo for one year to help mar­ket and pro­mote the busi­ness and/​or an approved product. Nom­i­nate your hero (or your­self) by March 31, 2014 by vis­it­ing earth​day​.ca/​h​o​m​etown, and you could be award­ed cash prizes and more to help fur­ther your work.